Forget touchscreen, solar powered or even self-destructing coffee tables... Kyle Downes has modded the coffee table into its best version ever: a retro-tastic NES controller. Just look at the sleek lines, the high quality finish and classy glass top. And then giggle at the fact that it actually works. Don't believe it? Check out the video after the gallery. Kyle spent months putting this together, starting with a scanned image of his original NES control. This he then simply scaled up, carefully crafting each piece out of MDF and hacking his own wiring onto a broken old controller board. 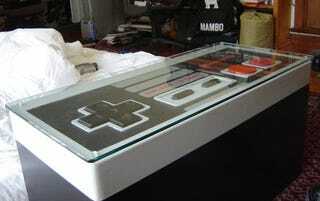 The glass top was the final touch, to protect those giant buttons, and inside there's plenty of storage. I guess if you're up for some giant 8-bit game-controlling action you'd probably need someone else on hand.